About 18 people were in the audience. TOTAL TIME: 1 hour and 13 minutes. President Berliner announced that meetings were now being video recorded with the goal of putting the recording on the district website. 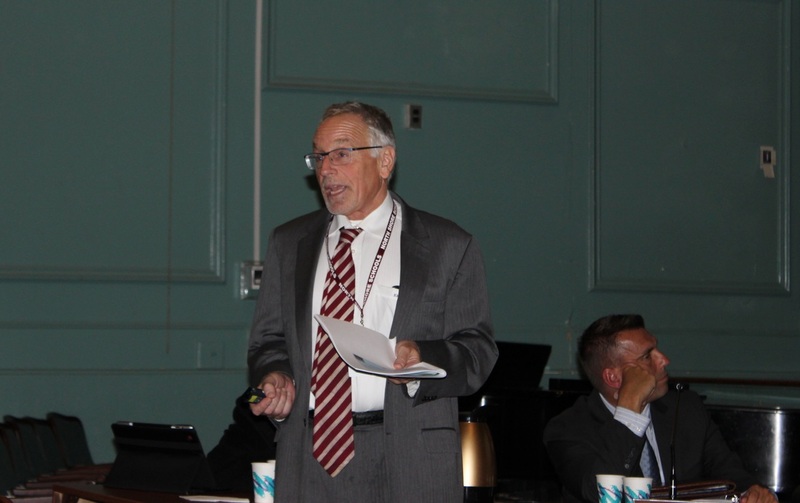 BUDGET PRESENTATION - Dr. Melnick gave what he said would be a "preliminary presentation of the first budget draft" for the 2014-15 school year, and that "it is not where the budget will end up." He explained that year to year increases in the last few budgets have been "significantly lower than where they were in the past." The superintendent then outlined the budget goals which he stated were to "work collaboratively with the community to maintain a high quality education for each of the students enrolled within the North Shore schools; maintain a fiscally responsible budget that is responsive to current economic pressures and remains within the permissible tax levy limit; reallocate resources in the budget to fund initiatives aligned with our district vision and mission; remain committed to a process of continual growth and improvement." He emphasized that he will not recommend a budget that exceeds the tax levy limit. He stated that any funding of new initiatives such as IB, World Languages, i-Pads, etc. was coming from the re-allocation of funds, not "new money." With the complicated formula provided by the state, and the fact that the inflation rate has been lower than 2%, Dr. Melnick said that the district's tax levy limit of $88,364,878 that was being shown in the presentation (an increase of about $1.8 million over the current year's levy) is probably about $169,000 higher than what the actual limit will be. Staying within the tax levy limit for next year's budget, he said would enable next year's spending to be 2.3% higher than the current year's. He said that in the budget overview that he was presenting that evening, there was a 3.315% increase over last year's budget and recommended to the board that approximately $933,000 be trimmed from the spending plan to bring it in line with the 2.3% increase. In addition to the tax levy, Dr. Melnick explained that the district expected to receive $7.8 million in revenue from other sources such as interest on real property, state aid, PILOTS, and Tuition for Special Education services. In total, revenue outside of the tax levy is expected to increase about $380,000 over last year. He recommended that the district once again use $1.1 million from the fund balance (the same as last year) to fund programs and keep the tax levy within the limit. He anticipated state aid to be slightly higher over last year. Dr. Melnick said that the budget is made up of three components - locally controlled costs, fixed costs, and revenue. 92.5% of the Budget he said are fixed costs. They include: debt service; transportation (for which changes in distance requirements can only be changed by voter referendum); special education; salaries and benefits, which he said are fixed unless positions are cut. While they are fixed because they are controlled by collective bargaining agreements, the number of people employed, he said, is subject to the Superintendent's and Board's discretion. Locally controlled costs, he continued, include interscholastic athletics and extra and co-curricular activities; instructional supplies and materials; board of education; and community services/summer school. Dr. Melnick then showed a slide comparing the 2013-14 budget expenditures to anticipated expenditures for 2014-2015 in general areas such as regular instruction, supervision of instruction, Special education, benefits and other areas (see chart below). He said that even with the recent passage of the bond, because new debt service is being phased in as old debt service retires, the increase in debt service for next year will only be $661. With regard to transportation, Dr. Melnick said K-6 is transported 3/4 of a mile and grades 7-12 1.5 miles. The state, he explained, legally requires districts to transport students in k-6 who live more than 2 miles from school, and 7-12 more than 3 miles. He said that the district could change its distance requirements, but to do so would require a vote by the community. Dr. Melnick then showed slides highlighting areas in which he said the district has saved money over the past few years. He said that nearly $15 million in contracted transportation costs have been saved since the building of the bus depot; that a conservative teacher's collective bargaining agreement saved about $3 million (assuming that the provisions of the 2008-12 contract were still in effect); the Honeywell Energy Contract saved $2.2 million; and a conservative administrative contract and the elimination of administrative positions has saved close to $2 million since 2009. Added together, he said the total savings has been about $22 million. Dr. Melnick said that he would be meeting with Building Principals, Department Directors, Asst. Superintendent Robert Cheblicki, and Assistant Superintendent for Business Olivia Buatsi, to find areas to trim the budget. He then displayed the budget review dates which are February 13, March 6, March 20, and April 3. The budget vote and trustees election will be on May 20. The Superintendent stated that he was sensitive to the financial issues facing the community. He warned that there is the potential for a shift in taxes because of the LIPA plant ramp-down. He said he will be proposing the "minimum budget that will be within the tax levy limit and allow us to maintain what we have." President Berliner stated that there are still uncertainties regarding the Glenwood Landing LIPA plant ramp down and the potential tax shift. He asked Dr. Melnick what would be the ramifications of a contingency budget and what would be removed from the budget with an additional $1.8 million cut. Dr. Berliner said hopefully by the time of the budget vote, the district would know exactly what the revenues would be from LIPA for 2014-15. The district, he continued, has received oral assurances that there would be no tax shift resulting from the Glenwood Landing Power Plant ramp down for 2014-15, but was still uneasy about the issue because he hasn't seen anything in writing. "We should prepare for every eventuality," he asserted. Dr. Melnick added that under the tax levy limit law, there is no contingency formula, other than having the existing tax levy limit for the next year. He said to get there would require a total of $2.8 million to be removed from the budget figures that were presented that evening ($1.8 million plus the $933,000 he had stated needed to be cut to get to a 2.3% increase). Dr. Melnick then said that with regard to the LIPA issue, the district was still pursuing a long-term strategy so as to have a gradual shift in tax burden through 2020. Tim Madden, Sea Cliff, asked Dr. Melnick to comment on Comptroller Thomas DiNapoli's report regarding fiscal stress on the state's school districts, and commented that it appeared that North Shore fared fairly well in the report. Dr. Melnick replied that the report showed that the School Board has done an excellent job of making sure reserve funds are very solid so that the district is in position to take care of a catastrophe such as a roof failure or other unforeseen occurences. However, the district's rating does not include the potential impact of the LIPA ramp-down on the tax bills of residents. He continued that a more revealing report is that which was released by the State Superintendents' Association which showed upstate district going into insolvency, and many others "looking over the edge of the cliff" this upcoming year. He said that North Shore has about six to eight years before reaching that point. Mr. Madden asked President Berliner who had given the district oral assurances that homeowners would not be impacted by a tax shift from the LIPA property this year. Dr. Berliner replied that it was the County Attorney's Office and the Executive Office. He said the district has asked multiple times that the assurances be put in writing, and the fact that they haven't, has made him a bit nervous. Mr. Madden asked about the work session that had taken place before the Town Meeting and whether or not there had been a posting announcing the meeting. Dr. Melnick replied that an e-mail had gone out and that it was on top of the agenda that was posted on-line. Dr. Berliner said that the board discussed the IB program during the work session. Arthur Barbuto, Sea Cliff, asked Dr. Melnick to explain the district's long-term strategy with regard to the LIPA ramp down. Dr. Melnick replied that the District has been working on the issue for the past three years - that an Albany based law firm was hired to "make sure our voices were heard by the state legislature"; and that the district has met with local officials. He explained that information provided by Senator Marcellino's and the governor's office showed a substantial shift of $10-12 million in the first year to residential and commercial taxpayers, a freeze for three years, and then a 1-2% decline until about 2020. He said the long-term strategy has been trying to keep the budget as conservative as possible, giving the community the choice, through budget votes, of whether they wish to continue "what we currently have" or "something less than what we currently have." Prefacing with, "this is probably not what people want to hear," he said of the 56 school districts in Nassau County, North Shore has the 44th lowest tax rate. He said that should the tax shift take place, the district would have the 24th lowest rate in the county. The superintendent continued that the district is trying to work out a glide path that would spread out the tax shift over a number of years. He added that the district has been given $2.5 million to offset the cost of any tax increase to residents. Ultimately, he said, it is going to be a community decision as to whether or not it wants to continue the same quality of education while picking up a greater share of the cost. Mr. Barbuto asked what sort or reduction in income would the district see as a result of the ramp-down. Dr. Melnick explained that the ramp-down would not bring about a reduction in income for the district but rather a shift of more of the the tax burden to residents and business owners. In the Governor's original proposal, he said, the first year shift would be $10-12 million which would translate to a 15-19% increase in school property taxes on households. President Berliner added that the district is still seeking a very gradual glide path. Mr. Barbuto said that it hasn't been all that clear. He expressed concerns that based on the small number of people in the audience, it appeared that many people were not aware of the consequences. Dr. Melnick said that it is difficult to be really clear because of the lack of information from the county. He said the worst case scenario would be a 15-19% tax burden shift in the first year, a freeze for three years, and then a 1-2% shift for the next ten years. Mr. Barbuto asked if the Board or superintendent had considered consolidation to lower operating costs. Dr. Melnick replied that for certain types of contracts, like for fuel and technology, the district seeks bids as part of a consortium with other districts. Mr. Barbuto said that he when he graduated in the mid 70s enrollment was significantly higher than today. He asked if the District had considered closing a school. Dr. Melnick stated that building usage requirements are very different today than in the past as a result of special education services and technology requirements which require more classroom space and so he did not think it was realistic, considering where enrollment is going to be for at least the next five to seven years. Mr. Barbuto said that he had heard the student to teacher ratio is 13 to 1. Dr. Melnick replied that that is the number of the adults in the district relative to students. He said class size numbers have been increasing and cited a kindergarten class at Glen Head with 25 students as an example. He said that average class size in the high school was 25-26. Larry Ruisi of Glen Head complimented Dr. Melnick on his presentation. Mr. Ruisi said that he believes that the cost of employee benefits will soon pass the costs of instruction, and that he is concerned about that. In addition, he said that he liked Dr. Berliner's idea of showing what an alternate budget with an additional $1.8 million in spending cuts would look like. He suggested that the district create and "ala carte document" that could list the possible spending reductions to see what the district's options are. Dr. Melnick said that one has to be careful when considering what programs to cut separately, because a reduction in one area could lead to increases in others - either now or in the future, as it could create a "ripple effect." Mr. Ruisi expressed concern that when cuts are proposed it is often to programs that large constituencies are emotionally attached to and so they feel as if they have to vote for the budget or lose a program they like. Mr. Ruisi asked if the LIPA numbers of $10-12 million would impact the school district or would the impact be on the taxpayers. Dr. Melnick replied that the schools would not lose any revenue, that LIPA's burden will be shifted to the the individual homeowners and commercial properties. The tax levy limit for the district does not change, he said. Dr. Melnick and Trustee Russo stated that the district is currently pursuing a lawsuit that would enable the district to be designated a "third party beneficiary" so that it could "have a seat at the table" in negotiations and litigation regarding the power supply agreement between LIPA and National Grid, and whether or not the property has been over-assessed. Additionally, Trustee Russo then explained that taxpayers may be protected by a real property tax law (section 1803) that prohibits, in Nassau County, taxes for one class (in this case residential and commercial) to increase more than 1-5% annually. It seems, she said, that a shift of 15 to 19% would violate that law. She said litigation on that issue is premature at this time, because the county has not yet made a determination if it is applying that provision of the tax law. Trustee Amy Beyer said that it was dangerous to list the items that could potentially be removed because it could be perceived as a threat and that it pitted departments against each other, athletics v. arts, etc. She said that she believed it was a good idea, this year, to show what a contingency budget would look like, and that would be good information for the board and the community to have. But, she continued, a list of programs or positions that could be removed, is dangerous, and did not recommend that course of action. Ms. Beyer asked for clarification on what President Berliner was asking for earlier in the meeting with regard to a contingency budget. Dr. Melnick stated that his understanding was that it was for what cuts would occur if a contingency budget were adopted, not a list of the costs of various programs and the different scenarios of what could be cut and what could be left in place. The programs that would be cut in such a scenario would be determined in consultation with building principals and department directors, he said. Dr. Berliner said that he was asking for what a contingency budget would look like. Dr. Melnick said he would be preparing a contingency budget as well as a budget that is at the tax levy limit. Dr. Berliner then added that if "we weaken our schools, we will weaken our real estate prices." He said that real estate prices are where they are in the district, in large part because of the quality of its schools. Trustee Michael Nightengale asked what proposal would be put up for a vote at budget time, if the district still does not know the ramifications of the LIPA shut down. Dr. Berliner replied it was premature to make that decision and expressed hope that more information would be available at budget time. Dr. Melnick added that "as the district's educational leader," it would be "highly irresponsible" to recommend a budget lower than what the tax levy limit permits. He said it is a community decision, with the information it has with regard to the LIPA issue, to maintain the same level of education, or to vote the budget down and say to the district "come back with something else. ""If you come in under the limit," he said, "you hurt your district for generations" as it would reduce the tax levy limit in future years. He added that taking funds from the fund balance or reserves to lower the tax levy was also unwise as it would hurt the district in year's to come because it is only a one year savings and that the district's bond rating would be hurt by "raiding the reserves." He said he believes strongly that the community has the right to see a budget with a 2.3% increase as well as the alternative should that proposal be voted down. Trustee Michael Nightingale said that there is a "level of uncertainty," and that taxpayers are facing a 15-19% tax increase. He said that he believes showing what a contingency budget would look like is a good idea, as it would give voters information and the ability to look at the "bigger picture." Dr. Melnick said that a $1.8 million dollar cut in the budget would not translate into a huge tax savings. He suggested that the district show what the actual savings in taxes would be for the average household if the proposed budget failed, and a contingency budget were adopted. He said he believed the number would be $100-150 per year. Residents, he said, should see what they are saving. He continued that he did not want voters to think that they will be saving the 15-19% if they vote down the budget. Eileen Stanton, speaking on behalf of the North Shore Parent Action Committee (NSPAC) said that the Middle School PTO held a meeting a few nights earlier at which Dr. Ferris presented on Common Core. She said that she was encouraged that he seems committed to a well-rounded education and not teaching to the test. She asked Dr. Melnick if he had been hearing anything from other principals regarding test preparation and the common core. Dr. Melnick replied that an advisory committee has been created to address the district's philosophy on assessments. It is made up of board members, administrators, teachers, and community members. He said that he thinks the conversation at the high school level is very different than what is taking place in grades k-8. He said the district wanted to alleviate pressure on teachers to feel as if they must teach to the test and that more room needed to be created for critical thinking, creativity and a passion for learning. He said that there was discussion with teachers about "teaching test taking as a genre" as opposed to spending time on test prep. For instance discussing the importance of understanding your audience when writing, and de-emphasizing Kaplan-style test prep. He suggested that less will be spent on test prep materials. He continued that, "we do believe in Common Core," but, "we do not believe in the way it was rolled out." He said that the district would like to develop ways of measuring of engagement, passion, and creativity that are separate from the test. Assistant Superintendent for Instruction, Robert Cheblicki, said it is important for students to understand authorial intent and as a reader and writer understanding the intended audience - that it affects the way one expresses himself and how to get a message across. He said that that has always been a part of the curriculum and that it is one way for test preparation to be an extension of the curriculum. Dr. Melnick added that there has been concern over pacing guides and scripted instruction and its impact on creativity. He said that he believes the district must hire the highest quality teachers and offer excellent professional development. For teachers to have autonomy, he asserted, they must have a clear framework "so that kids are not all over the place." Expected outcomes are the same, he continued, but the route each teacher will use to get there will be different, and each teacher should have the flexibility to choose that route. A - Resolution to issue bonds to finance capital improvements adopted unanimously. Action Item J - budget transfers was tabled and postponed to the next meeting so that Board Members would have the opportunity to review them. Dr. Melnick said that they could e-mail him questions. Trustee Beyer said that she would like the district to have a formalized way of of thanking those who have donated items to the district. Dr. Melnick stated that he has developed a draft of a formal letter. Trustee Beyer said she agreed that with Dr. Melnick's view that the the cost per household that would be saved if a proposed budget is defeated and a contingency budget adopted is information that residents should have. Trustee Russo said that she did not support that proposal because properties are assessed differently and that the amount people pay in taxes varies, and so it could be difficult to come up with an accurate figure. Dr. Melnick stated that the amount per taxpayer could be given for a particular assessed value - $700,000 for instance. He said that he and Ms. Buatsi could develop an agreeable way of doing it and then "run it by the board." Trustee Beyer said that it is important to be careful with how figures are given regarding budget savings. She cited the savings shown for the transportation depot and the energy performance contract. With regard to the transportation depot, she pointed out that line-item savings for transportation contract costs were shown, but the costs for debt service to finance the building of the depot were not shown. And while, she continued, the district has realized considerable savings, the difference between the savings and the costs incurred should be shown, rather than just the savings. Trustee Russo asked about the $2.5 million the district received from the state legislature to offset any tax shift from the LIPA ramp-down how that was being handled. Dr. Melnick replied that it was not included in revenue, and it is currently included in the fund balance. Dr. Melnick replied that at this point, it is important to not use it to offset the tax levy, because it will affect future tax levy limits. But, because of the decrease in the consumer price index and how that will affect the tax levy limit, he may recommend that a small portion of it be used to make up the difference. He said that the recommendation of the auditors is that that money go into a tax certiorari reserve fund. The Board, he said, would have to decide the appropriate reserves to place it in. TOTAL TIME: 1 hour, 13 minutes.